Interactive Notebooks are only useful if the students can find the information later! Use these simple organizing tools to help your students organize their notebooks! There is a page for ELA, Math, Science, Social Studies, and Reading! Show, Not Tell Descriptive Writing Set. Reading Logs for a Full Year. 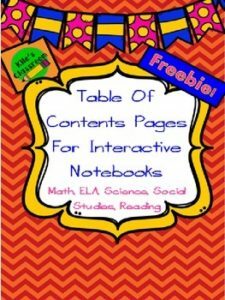 5th Grade Math Interactive Notebook. login). Beside each purchase you’ll see a Provide Feedback button.